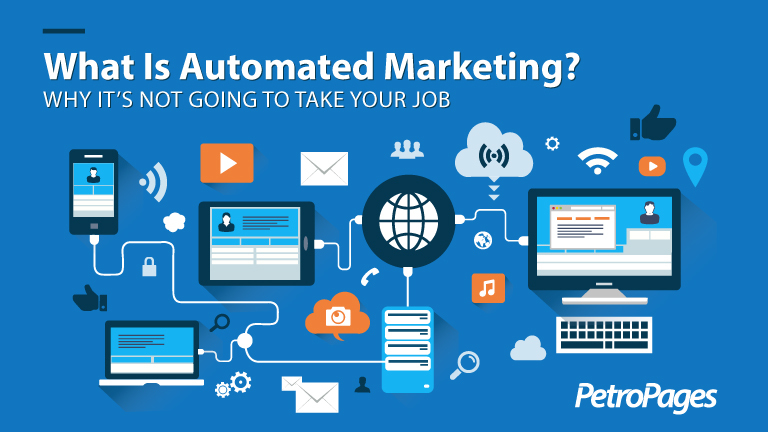 We’ve all heard about automated marketing but what is it and could it possibly take your job? I mean what are you going to do if all of your business’s marketing is automated, you can only make so many brochures and PowerPoints right? Well rest assured that while automated marketing is a smart idea, it’s not smart enough to replace you. Let’s go over what automated marketing is, what channels it’s used on and some examples of how it can be used and actually take care of those tedious tasks and make you look smart! Marketing automation is software that allows companies to streamline, automate and measure marketing tasks such as emails, social media and website actions. The goal of automated marketing is to nurture prospects down the sales funnel with highly personalized, useful interactions that provide prospects and customers with the information they need, at the right time, in the right channel. It also allows you to score and keep track of your prospect’s actions and interests. This helps you follow up on the most interested prospects and focus your conversation on the offerings they are most interested in. What Channels Are Marketing Automation Campaigns Used Across? Automated marketing campaigns span across multiple channels to connect with your prospects and customers where they are naturally throughout their day. Good automated marketing mixes email, social media and website content but can also be enhanced to include mobile, phone calls and even direct mail pieces. It is a powerful tool that can be utilized to take your marketing from one dimensional to multifaceted. You write a blog post about a product that you will be featuring at an upcoming trade show. An email is sent to preregistered attendees that points to the blog post. A dozen of the recipients take the link. These visitors receive an email inviting them to your hospitality suite during the show. You are sent an email encouraging you to initiate a connection via LinkedIn with these prospects. Three of the visitors navigate your website further. Based on the pages they visited they are sent emails pertaining to the products they were visiting. All of this information is captured on your CRM. All of the actions by these prospects are weighed and scored. Before the show you run a report that tells you which attendees have demonstrated the most interest and what those interests are. After the show the process continues. You write a blog about some of the questions that were raised about your product and an email is sent to the previous recipients plus any additional prospects that you met or picked up during the show. As you can see, there is substantial effort required to support the content that is used in Automated Marketing. However, the ROI gained by moving prospects along and focusing your efforts on the right targets and those targets interests are extremely attractive. The work and attention that it would take to nurture this prospect manually would have been overwhelming. This is where marketing automation comes in to help your marketing team communicate with your prospects and customers across all of your marketing channels. When done correctly, effective marketing automation is not a simple plug and play solution. It takes time, effort, resources and someone to implement and maintain it. To be effective it requires a comprehensive strategy that integrates the right people, processes, content, data, etc. By investing your efforts in developing these areas, you can achieve a solid ROI while utilizing your marketing team’s talents to attract prospects. Automating repetitive marketing tasks frees up your marketing team to create stronger communication through focusing on the quality and messaging of your campaigns. Content is still king when it comes to attracting new prospects to your business. Having your team available to create and design truly remarkable and shareable content is where their efforts should be instead of being neck deep in spreadsheets and follow up tasks. Purchase Follow Up – email that is sent once item is purchased, being shipped, delivered, asking for a review/feedback, promote repeat business. Product Launch – email, social media ad, interested prospects will click link to read blog post about new product and complete fill form to receive a call from sales rep to get more info. Event Invites – campaign that sends invites, tracks responses, follow ups, social media ads, reminders and post event thank yous and feedback requests. Event Followup – campaign that sends summary, tracks responses, follow ups, social media ads, post event thank yous and feedback requests. Great for Lunch and Learns or Trade Shows. As you can see, automated marketing campaigns can be as simple or as intricate as you would like them to be. This is a benefit that allows not only large corporations, but also small businesses to take advantage of this powerful tool. Getting in front of this technology now allows you to build a solid foundation to help your business grow and be competitive now and in the future. Interested in learning more about automated marketing or need help developing your campaigns? Complete the fill form below and one of our automated marketing specialist will reach out to you with more information.